I would consider myself an athletic person. I played sports as a child and I’ve run marathons as an adult. 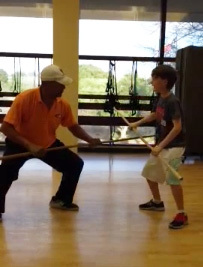 But when I watch my nine-year-old son with his Sifu, practicing his Kung Fu techniques, I’m not sure I could do it. They move fast. None of it is fake. If my son doesn’t place his hands in the correct position, his fingers get hit with the staff. And this video isn’t even as fast as they can go. They can move much faster! I’m so proud to share this video with everyone for many reasons. First of all, look at that technique and speed! Secondly, my son is autistic. When he was diagnosed almost six years ago, he had no core body strength and he was non-verbal. Look. At. Him. Now. Thirdly, they will perform this exciting Kung Fu combat routine in front of nearly 300 people at a local talent show next week. Fourth, my son doesn’t get nervous at all! In fact, he spontaneously grabbed the mic last year to get the crowd involved.